Better, bigger and stronger than goose eggs, I give you the ostrich egg. Don’t look any further, it’s unbeatable: it’s by far the biggest and heaviest of all eggs. I’ve had the opportunity to eat one, here is the whole story. 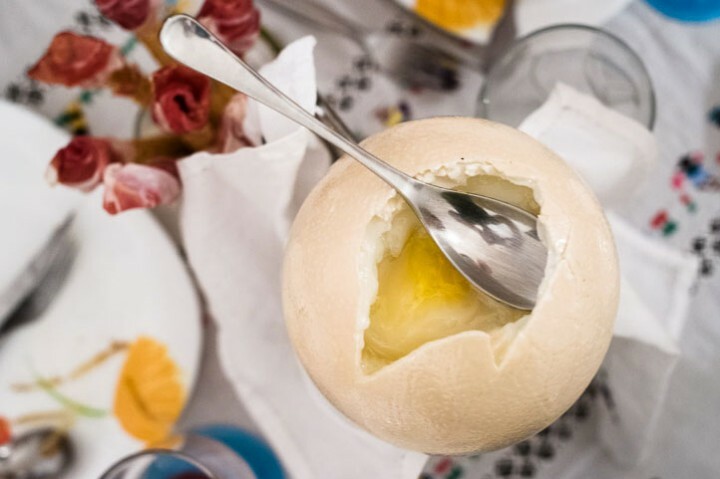 When my friend Edouard, a real soft-boiled egg lover, invited me to eat an ostrich egg, I screamed with joy. He had bought two of those eggs in an ostrich farm in the French region of Loiret. Indeed, though ostriches are originally from Africa, they are farmed in Europe because this activity is compatible with our climate, but also because it is very profitable. Ostrich farms produce big amounts of excellent red meat, richer in proteines and iron than beef meat, with only 2% fat, as well as eggs (between 30 and 50 eggs by ostrich between march and october, or april and september, depending on the region), some leather, feathers and even oil. So they have a very diverse production and they use the whole animal. According to most of those producers, ostriches are the future. 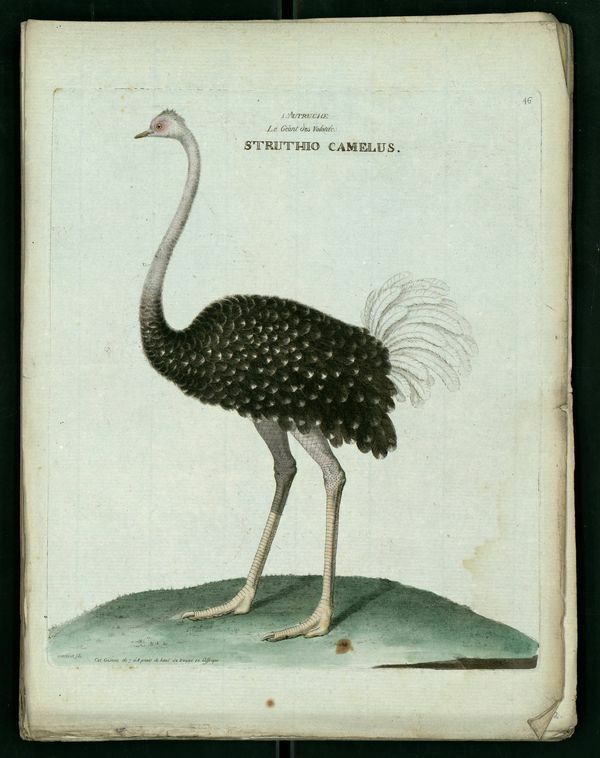 Just a few words on that story of ostrich oil, because it might seem weird. It’s extracted from the fat of the animal and is rich in insaturated fats. It’s supposed to be good for muscular mass, and excellent against diabetes, cancer and cardio-vascular diseases. It’s also said to be used in dermatology and cosmetology. I’m not sure wether all of this is true, but just to be sure, let’s kill ostriches, we’ll see afterwards if it really works. When I say that ostrich eggs are huge, I’m not joking. Ostriches are the biggest birds alive; females can reach 2 meters in height, males get to 2.80 meters. And their eggs, with a 15 centimeters diameter, weight around 1.6 kilos. Half of the weight is the white of the gg, the two other quarters are the shell and the yolk. One ostrich egg is the equivalent of 25 chicken eggs. So there is no way you’ll eat it on your own, unless you’ve decided to commit suicide in a very interesting way. At Edouard’s, we were 7 people. The adventure began when we wtarted cooking this monster. Usually, it gets soft-boiled after 35 minutes in boiling water. Well, you can actually go wrong. And once it’s open, you’ll have a very bad surprise. Which is, of course, what happened to us. The opening itself is epic. The shell is impressive, 2 to 3 milliters thick. Don’t be scared, if you let it fall, it’s not really a problem. This egg is armoured. To open it, Edouard had to get some serious tools. Well, you can use only a hammer if you’re planning to make scrambled eggs. But if you want it soft-boiled, you’ll have to do better than that. Ideally, if it’s perfectly cooked, you should open it with a saw, yes a saw. If you have doubts about it being cooked, begin with a small hole that you’ll make with a screw-driver and a hammer, or an electric drill if you have one. Then you’ll be able to see if it’s ready to eat, judging by the aspect of the white part. Ours was not ready at all, so we had to go on cooking it although it was already open. So we had to maintain it in a good position in the pot, so the water could not get inside of it. Edouard used a piece of cloth that he put around the egg so it perfectly fitted the pot. 2 hours later (maybe I exagerate, but it seemed like forever), we used a bowl to make the egg stand on the table and we started eating. 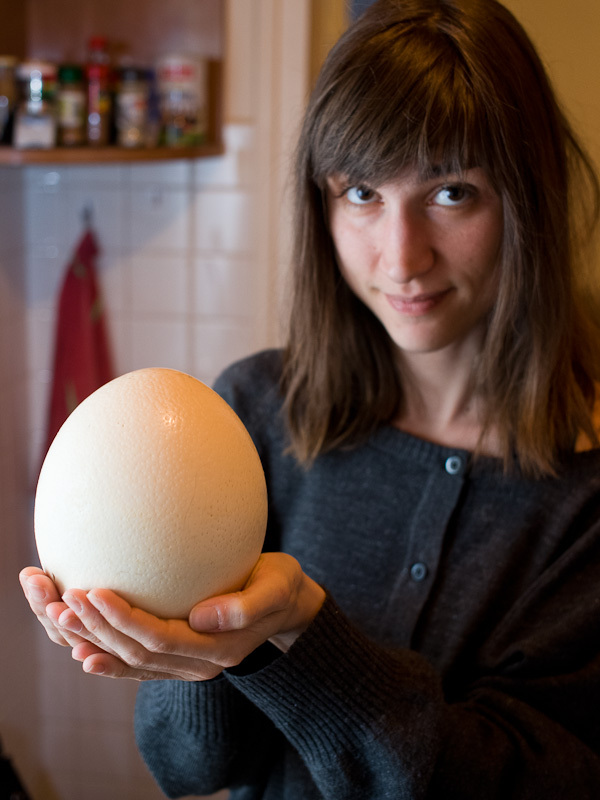 Surprise, ostrich eggs are actually giant goose eggs. Same colour, same viscous and thick texture for the yolk, same aqueous white, same flavour. Even though the white is cooked, it stays translucent and is a bit chewy. The yolk is sticky and bright yellow. And though we were 7, we have not been able to eat it all. Like goose eggs, they’re not the best eggs in the world in terms of taste, but the ewperience is absolutely worth it. There are producers everywhere in France, Australia, Africa, the USA and so on, so you should try at least once this ultimate egg. Yup, my mind slipped translating the French version, which of course doesn’t say that… Thanks for telling me! The “ewperience” as in…ew! 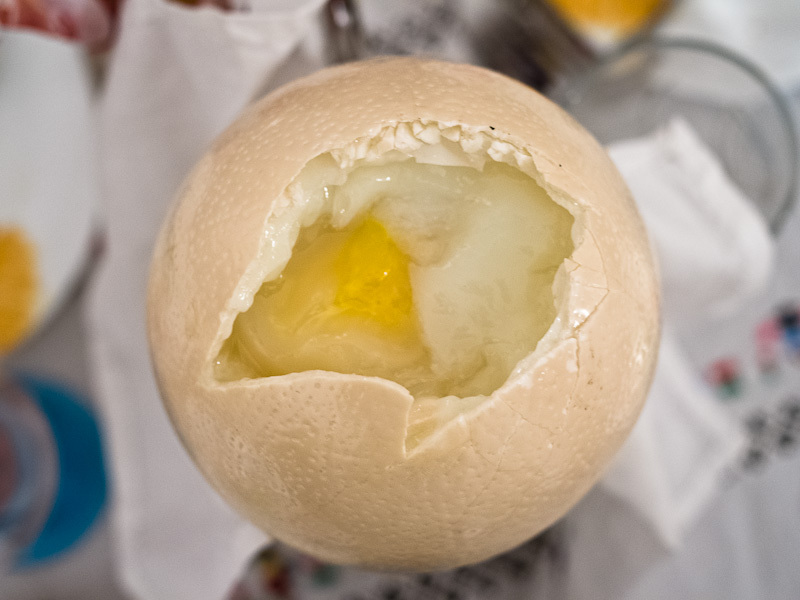 A soft-boiled ostrich egg was featured in Season 2 Ep. 6 of “Atlanta,” essentially a horror episode in an otherwise comedy-drama series. The image of a disturbed and weird-looking man digging in was unsettling and gross.